Instant Pot – Virtually Instant, Really! Recently, I had a chance to visit my fellow Minnesotan friend Tanya, her spouse Justin, and their daughter Mabel in Portland. They graciously had me over for dinner, and I got to see a demo of the Instant Pot. Apparently she was so excited about it she bought a second one when it was on sale on Amazon. My friend Candace in San Francisco had previously bothered messaging me about this device as a sped up way to make radish cakes, so it seemed only right that I listen to the universe’s repeated prodding to investigate this gadget. 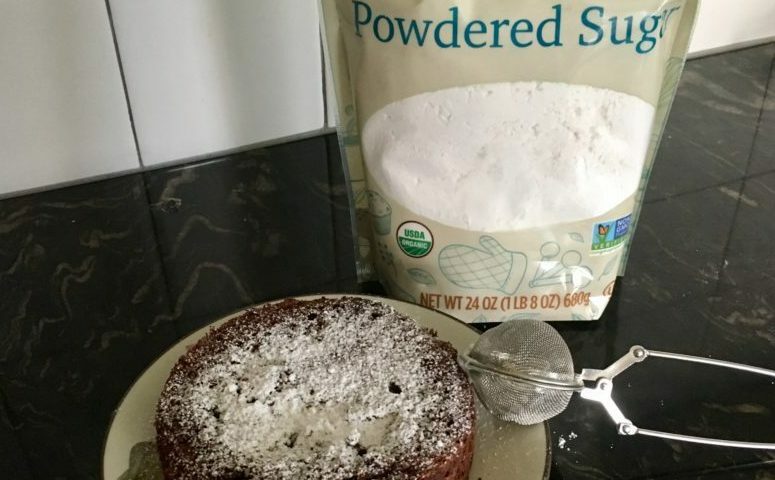 How can you dust powdered sugar on your holiday desserts without making a mess, AND conserve the left over for the next round? Try a tea infuser! Here’s the shortest video I’ve ever intentionally made, lol. I’m pretty sure even if you don’t have one with an easy handle and all, it’ll still work neater than a gigantor flour sieve. Then you can return the rest to the bag! 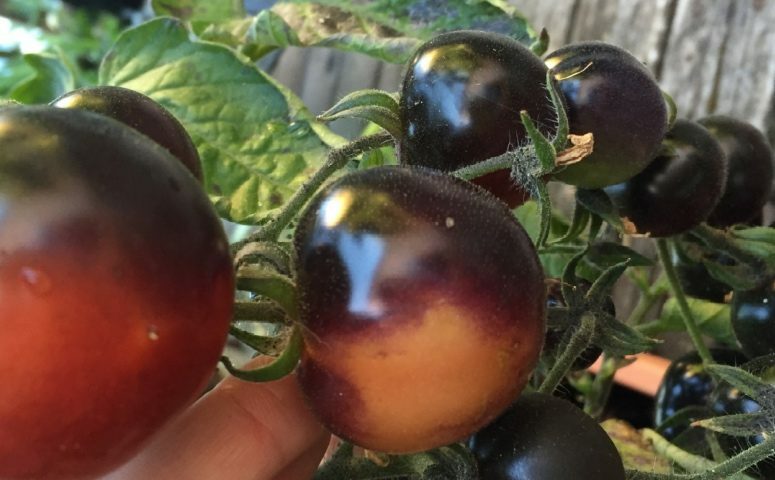 You know how I hate food waste..
Double-feature bonus posts this week! My offering to you, Dear Reader, for being a faithful audience. Enjoy! A few years ago, I found myself buying one of those cup-salads from Whole Foods a lot in the summer. I liked it so much I figured I should start making it, so I can (a)get it without cilantro and (b)stop feeling like such a yuppie for buying a salad I could clearly reverse-engineer to make myself. Now when I’m up for more than throwing together some greens with nuts (read: up for more chopping), I’ll use this mix as the base recipe and improvise from there. I was actually pretty surprised when I couldn’t find a blog entry for this. Perhaps because it’s so straightforward, it didn’t feel like a recipe. This week’s weather in Seattle is sneaking up to the mid-80s, which counts as hot, so here’s a good option for those hot late Summer days when you don’t want to add another degree to your house by turning on cooking appliances. Air conditioning is a luxury, yo. You guys, I have a confession: I hate cilantro. * I used to think I hate parsley, but in the last five years its resemblance to the flavor of cilantro has faded. Then, I had the privilege to vacation in Chile last year, and there was this sauce that kept appearing at restaurants with the steak. It tasted of garlic, and was full of green stuff. I liked it so much I had to stop a waiter to find out what it was. His reply was: chimichurri. Obvi, K and I had to grab some pre-mixed (as training wheels) packets on our habitual grocery-store-for-travel-keepsakes** run before we left Santiago. I think it was a Carrefour..
Fast forward months later when I finally got around to mixing it up as K seared some steak on the Big Green Egg, some balsamic vinegar, and olive oil, and a bunch of the dry packet. Eh, it was okay, but it also kind of tasted like dried leaves and dust. Long-time readers may notice this packet also made an appearance in one crispy-bottomed oyster mushroom steak post. The sauce was much improved once eaten on top of something, but I feel like anything you pour atop something else, even if a little strong, should be able to stand on its own too. 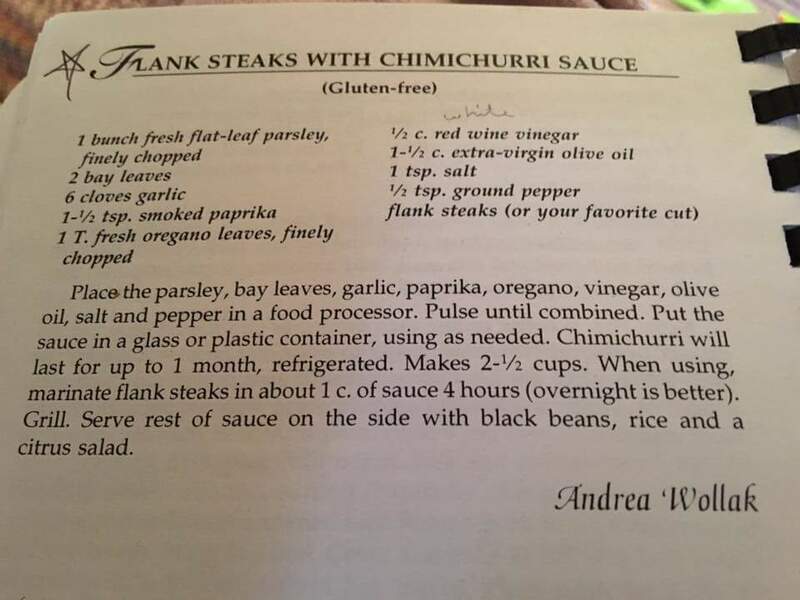 Chimichurri sauce recipe, thanks to L. Borchert! 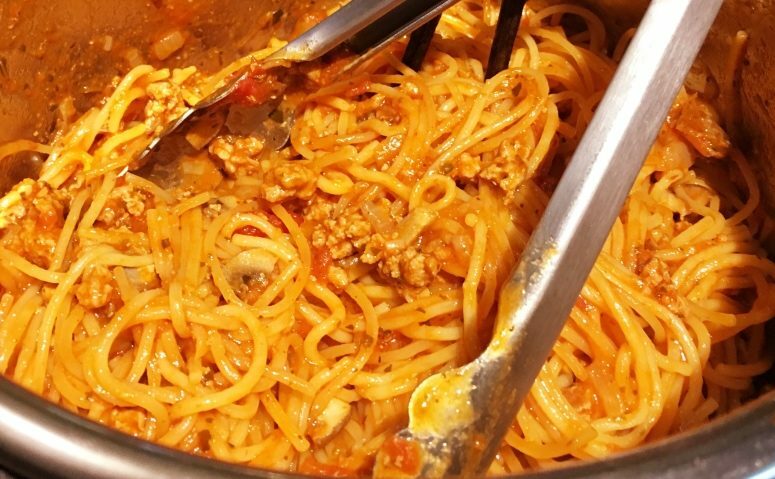 Introducing a new category for this blog: crunchy. I’ll be indexing recipes by what’s got that crispy, crunchy thing going on. 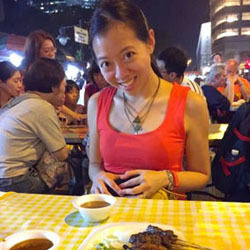 Contribute by writing in the comments with your top favorite crunchy Food the Wong Way recipes, and stay tuned for a new “crunchy” category in the navigation menu! Sorry I’ve been a little M.I.A. with no weekly post for a while. I started a new job assignment and was pretty busy with that, …and a quick vacation in Kauai to get some quality relaxation in before my work & life falls back into hectic-ness. Also just generally always busy trying to seize life by the throat and shake it all around.. Factor 1: Ah, how memories blur with time. A few years ago I got the privilege of exploring a little bit of Turkey, mostly Istanbul. As an ancient history fan, it was super exciting to explore this city with so much East-Meets-West history, with layers and layers of stories all piled on top of itself, not to mention multiple legacies of countless Roman leaders! That, and trying the food was such an adventure. 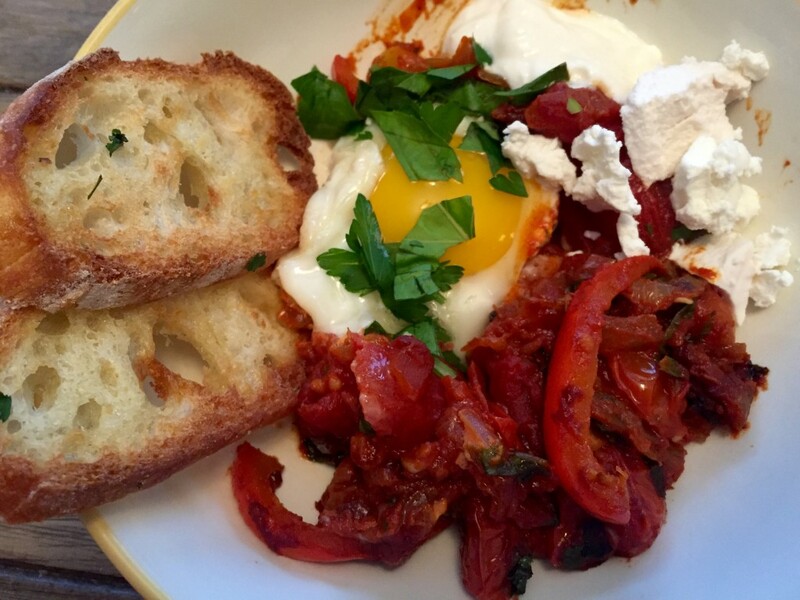 I still dream of the egg and tomato dish I ate on an Airbnb host’s recommendation near Galata Tower in Istanbul. Fast forward to now, when I finally get around to trying my hand at the recipe below: tomato, egg, peppers, sounds delicious, right? Sounds the same! Factor 2: When I was a kid and my mama went out of town I’d look forward to my Baba making his signature dish, egg and tomato fry. Yum! Apparently, it is a popular combination with me.. I was hunting for chickpea recipes a while ago to help me eat more lean protein, and I tried this one. I did not like the result. Then I ate some the following day, and it was delicious! The flavors just needed to marinate more. I took the recipe and cut it in half, because I was making an other giant vat of soup in parallel. This is a nice hearty one for winter, I made a pot on Sunday for the rest of the week. 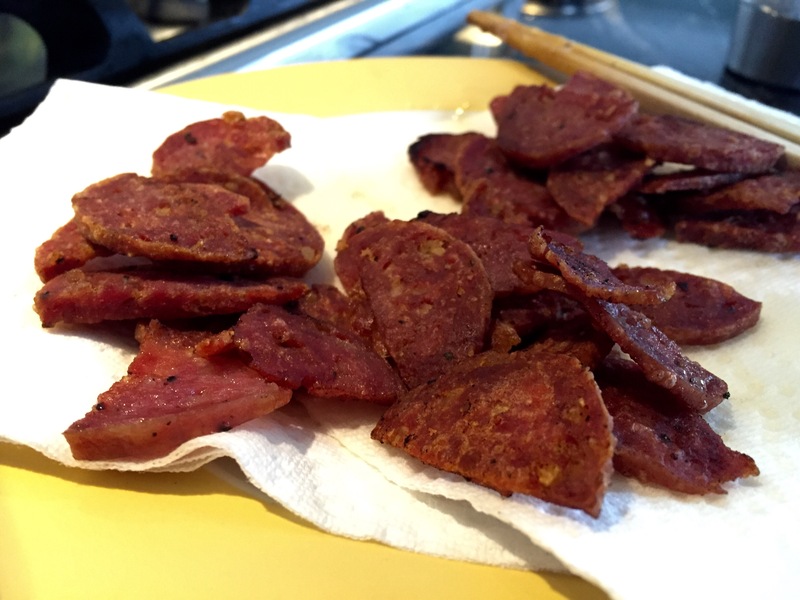 Pan-fried chorizo! tempting to eat it this way. 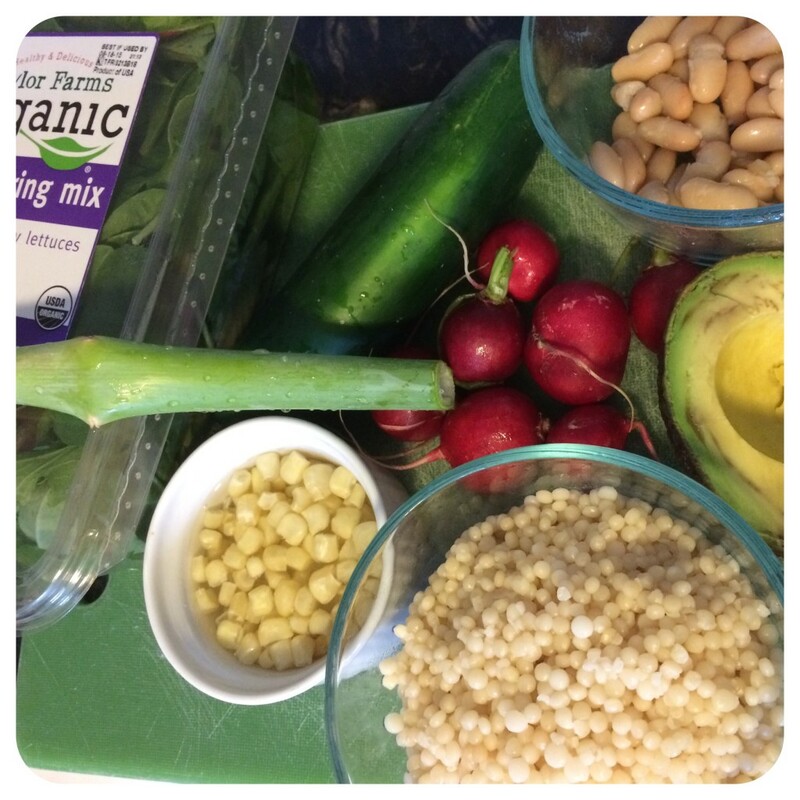 A variation on Cristina Sciarra’s Radish Cous Cous off Food52. I looked in the fridge, and all we had were drumsticks, an onion, and a bag of frozen pineapple. I had just a little extra time before my spouse would arrive home from his 20 mile bike ride, so, seized with a mild feeling of inspiration, I took a shot at this classic filipino dish of comfort food (perfect for old school methods of non-refrigeration preservation). Based on Chef Buen Viaje’s recipe, one of my sources for inspiration for spam musubi. Note: might want to start some brown rice cooking before you get to chopping for this! 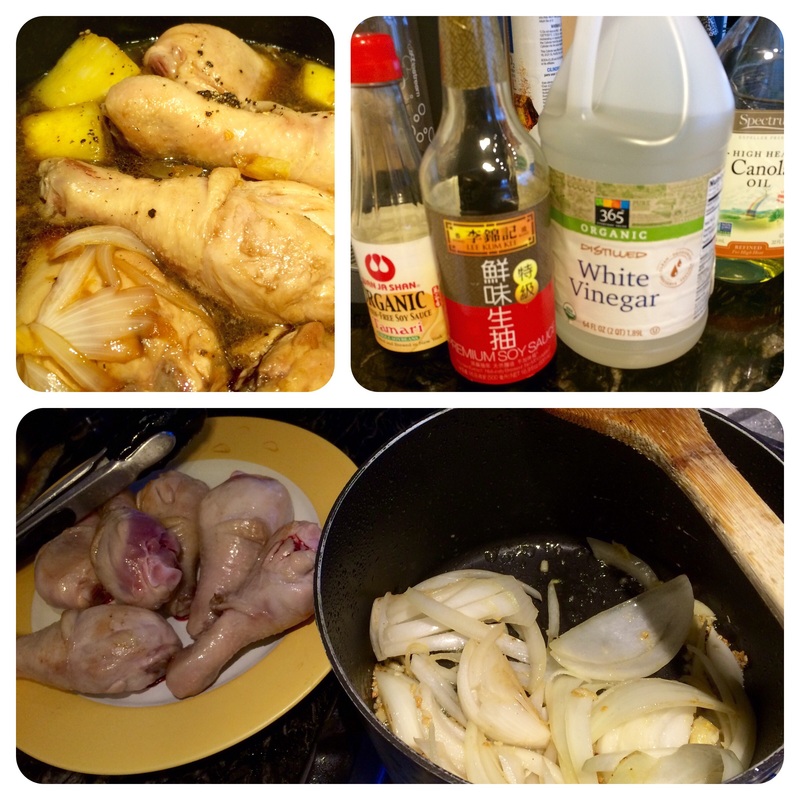 Chop, brown chicken, carmelize onions and garlic, simmer, simmer, simmer. Beat the Heat: Part Zillion! A variation from simply real health I googled after a random Instagram find. 1. With a vegetable peeler, thinly scrape the zucchini and summer squash into long ribbon slices, tossing the seedy core, or saving it for a Sunday frittata mix. 2. Add the ribbons to a bowl, season with sea salt* and pepper*, basil, drizzle with olive oil* per preference. [*NOTE: if you want salad for later, pack the zucchini separate from the olive oil, salt, pepper and lemon juice to keep the crunch, and combine just before eating]. Toss to mix. 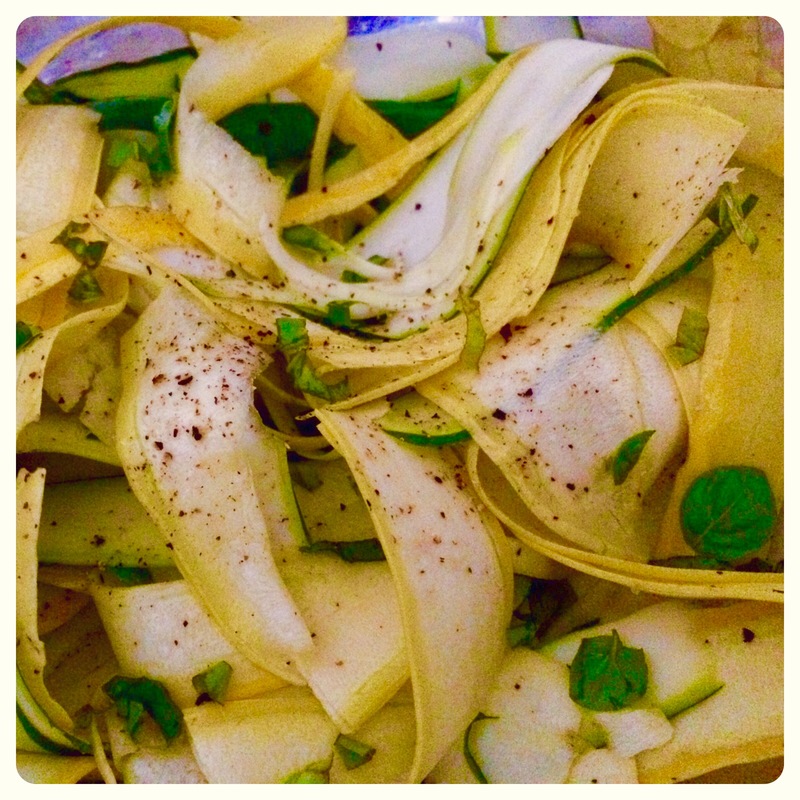 Ribboned zucchini with salt ‘n’ pepper.